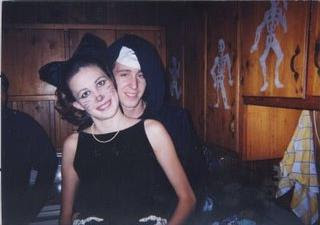 This is our first Halloween together back in 99...look at how young we look (and how tiny my arms are)! Some random year. It took us a long time to start dressing in couple costumes. This is only half on Nicks costume, and is actually his back...he had an additional costume on the front side...as for me, my mom made my outfit, and made it scandalously short This was our first couple costume, and it is one of my favorites. These were totally made from scratch (like anybody would sell these) and Nick is wearing women's underwear. He will do anything for a good costume. Last year we were Tetris. That shape would also be good for a pregnant girl! Wow - we never do anything like this in England. 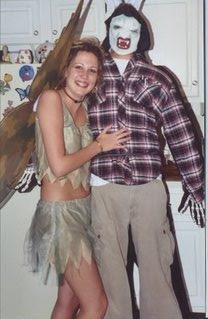 The one time we holidayed in the US we were there for Halloween and couldn't believe how many people dressed up. We're lucky if even one child knocks on the door asking for sweets - we might get some this year as there are some kids in our block of flats. T is really into the holidays though like me so hopefully we can have a good time even if it is just us! WOW. 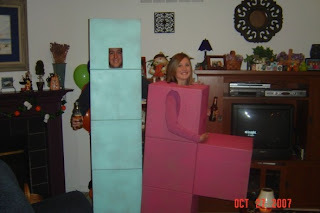 I am in LOVE with the Tetris costumes. I.am.jealous. hey, how about going as pea in a pod this year... with you oviously the pod with the pea inside?? 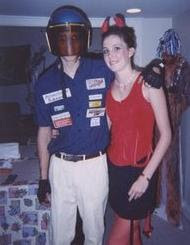 I always had the best times at your Halloween parties! Can't wait to see what you two have dreamed up this year - don't forget to take pictures! Jenn has the copy of the scissor-hand costume in one of her scrapbooks. I've seen it before. One of the best! !